In bars, on sofas and around internet forums, the conversation about who the greatest quarterback of all time is will never die. But should Peyton Manning win Super Bowl XLVIII with the Denver Broncos there can’t be much argument left. Fresh off of the greatest regular season a QB has ever compiled, winning the Super Bowl with this record breaking Denver Broncos outfit would be a romantic finish to a season to rival many Hugh Grant films. Win or lose, Manning says this will not be his final bow, although after the year he’s had a second Championship ring must feel like an awfully good time to call it quits. That Peyton only has one to his name so far often leads to many belittling his achievement in the game, after all even his younger brother Eli has two. 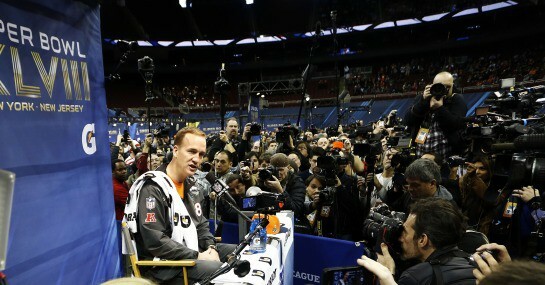 But since the opening day of the 2013 season, his second after having surgery on a career-threatening neck injury, Manning has set about blowing people’s opinions out of the water. He threw seven touchdown passes that day, one of just six men to do so, and went on to record the highest marks for both passing yards and touchdowns in a season. Now his Denver Broncos are 5/6 to complete their stellar season in perfect fashion, with Manning the 11/10 favourite to claim the game’s MVP prize. It seems written in the stars that Manning should win it all at Super Bowl XLVII in New Jersey, not least for the romance but for the symmetry too. His last Super Bowl ring came in 2006 with the Indianapolis Colts, back then they had two running backs combine for just short of 2,300 yards, the least sacks allowed in the NFL, six receivers with at least 30 receptions and a defence that improved rapidly in the post season to allow no more than 16 points per game. Now with the 2013 Broncos, Manning has all of those things again. Some things are just meant to be.